This is the second part in a series I call “Exploring My Creativity”. An examination of MY creativity. Being a creative person, this is something I feel I must do to expand my creative thinking. Know one self. A very large part of who I am is my creativity. As long as I can remember, I have been creative and doing creative things. And it seems to grow more complex the older I get. At the start of 2018, I told myself I wanted to embrace the idea of “Concentration and not Validation”. To focus on me and what drives me to be creativity. Check here to read part one of “Exploring My Creativity”. The second part of my creativity is my Inspiration. If Passion is my fire, then Inspiration is my fuel. Without it, the fire does not burn bright or fierce. It keeps my creativity going. And like any fuel, the quality of it is what’s important. You don’t want to fill up a Ferrari 812 Superfast with 87 octane. You want 93 or better! I’m not looking for material that is “kind of cool”. I want amazing, beautiful, captivating and most of all it must inspire me to keep being creative. Things that get my gears turning and or gets me to think about something differently. My Inspiration has is a routine. Like my Passions, it must be nurtured along with be well maintained. My routine to find inspiring material is search, review, weed out, search more. It comes for various and sometimes odd places. So, everyday I take time to search and look for new inspiring material. Doesn’t matter how I feel. If I’m upset, frustrated or just tired. Most times it helps me get out of whatever funk I’m in and loosen up my gears of creativity. It doesn’t mean I find new material everyday. But went I do find something, I save it to my PC and on One Drive (Microsoft cloud storage) so I always have access to it from my phone. I have a folder for each of my Passions, model making, photography, artwork (for illustrations) and writing. These are my digital inspirational boards or Vision walls. What I find inspiring in the past, may not speak to me the same today. Because of that, I must maintain my inspirational material. About once every few months, I’ll go through my folders and remove any material that no longer inspires me. Two or three images at the most. What inspires me is different for each of my Passions. For example, things that inspire me about photography does not inspire me with model making along with things that inspire me about writing and blogging does not inspire me to do illustrations. I want to go through a few of my Passions sources of Inspiration. Let’s begin with photography. I search Flickr for generally all-around photographic subjects. I’m not saying the best images are there, just that there is something different every day. Everything from landscapes, wildlife, floral to portraits. Both black & white and color. As I look through those images, it reminds me of when I first started my adventure into photography, shooting anything and everything. It helps me keeps that mindset of discovery and playfulness fresh in my mind. Some days it is painful, browsing through countless images. And other days, it can be refreshing and re-energizing. It’s those days I can get lost into the “rabbit hole” in the search for material. One thing I find wonderful about Flickr, is went you find someone who has a ton great image. It’s that discovery and seeing the work from of other creative souls, I find that incredibly inspiring. One thing I must be conscious of is to just seek out what I find inspiring and not critique and judge other’s images. No good will come from me looking down on ANY one’s images. We all must understand that everyone learns at different speeds. And not everyone will like YOUR images. On to Aviation photography, back in the day we had Fence Check. Which at it peak was nothing short of amazing. But now it is long gone. And there has not been an equal in aviation photography forums to fill that void. I tried Instagram for a while and did not like it. I felt it was more a popular contest then anything else. Along with the limited image size, which I did not care for. There are a few aviation threads on various photography forums. But I find these threads move fast, and images get buried in the thread due to the speed of the forum. Yes, these threads are a great source for inspirational material, but they are not consistent. I have found that Airliners.net proves a good mix of aviation subjects consistently. Yes, there are ton of documentary photographers that shoot nothing but airliners and are set in their ways. Not everyone who post images there share that mindset. It is those who think outside of that box are the photographers I’m interested in seeing their work. Photographers who understand and use the elements of design in his or her images. Over the years, surprising I have managed to find a fair number of inspiring images there. There is also AirFighter.com but there is more to aviation photography then just war machines. Into my love of model making. I been building models since I was seven. 35 years later, I still love playing with plastic. One source of inspiration for me to building anything, comes down to a single question, “What if…” I’ve built models for competition in the past and all the research and kit correcting is no longer enjoyable. So, I started to build the things I wanted to make. That’s where my favorite question comes into play. What if Israel had A-10 Thunderbolt II? What would they look like? How would they modify them? What I find inspiring in model making, is the imagination of the idea along with the craftsmanship of the model. This doesn’t mean that every model I find inspiring is a “What-if” builds. It could be the way a model is weathered, a paint scheme or the level of detail in a scale. Even difficult paint jobs have always been a source of inspiration. Like natural metal finish, splinter pattern or a digital camouflage. Craftsmanship is huge for me. Doesn’t matter if it’s a “What-if” or a “Real world” build, a well-built model is always motivating. Some of the best model I’ve seen are ones that when you look at them, you can’t figure out what scale they are. I have seen 1/72 scale model with so much detail, you would think it is 1/48 or larger. Something else I love, is when someone takes a substandard kit and turns it into a thing of beauty. 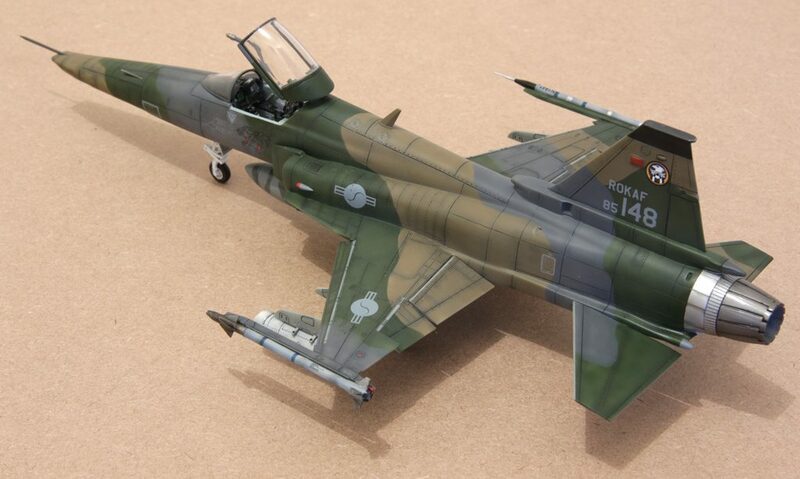 Like Cyrus Tan 1/48 Monogram F-14D Tomcat. If you have ever put together this kit, you know just how much work he put into his build. Also, I find inspiring is when someone kit bash or modify something that looks believable or turn it into something even more interesting like this, 1/18 Spitfire Mk. XIVe – Race #80 built by Peter aka “Airscale” over on Large Scale Plane forum. He started with HpH 1/18 Seafire FR47 which has fiberglass fuselage and resin detail bits. Then he converted it into a Spitfire Mk. XIVe and skinned with it in aluminum litho plate! The amount of time and work along with research that going into a project like this is absolutely astonishing. His work in progress thread is over 160 pages! But if you are like me and love model making, it is worth spending some time going through it. He does truly mind-blowing and inspiring work. Which pushes me to try to do more with my models. To experiment with new techniques and materials. It sounds so cliche but thinking outside the box. To be outside of my comfort zone. With all of Passions, if I’m just doing that same thing, using my same techniques, I’m not growing. Blogging, my newest Passion. 2018 is my second year of sharing with you all some of my thoughts. I posted more last year then this year. I’m still learning each time I post and I’m not sure what direction it is headed in. Yeah, I struggle with grammar and spelling. But I’m not going to let that stop me. I can’t, I enjoy sharing too much. So, what inspires me to write? My personal drive to be heard and to share my experiences that taught me something valuable. I have always liked the idea of passing on knowledge I have learn from other or from my own experiences. I’m still sorting out what it is going to be. Just like my photography, I’m looking for unique and personal experiences to share. I wanted to share my inspirational folders with you all, but I don’t feel it is right to share others images and work with out their permission. But my goal is to have my work fit into my inspiration folders. Not trying to match or copy someone else work but to have my work look as if it belongs in my inspiration folders, having the same flavor and feeling. To sum it up, I’m inspired by Photographers whose images can tell a story, Model makers not kit builders along with great Storytellers. What inspires you? Feel free to share in the comments below. If you like what you see and read here, click the “Like” button or start to follow my blog. This entry was tagged Adventure, art, awesome, creativity, fun, Inspiration, life, Passion, uncategorized, writing. Bookmark the permalink.